I just love these bullet points I got from the folks who just put on the Vineyard Cup regatta over in one of my favorite preppie enclaves on earth recently. I love it because it shows how awesome it can be when a strong fleet of boats get together for a weekend of summer fun and racing around Martha’s Vineyard. But even more importantly, it shows that you can run a regatta without generating tons of environment destroying trash. 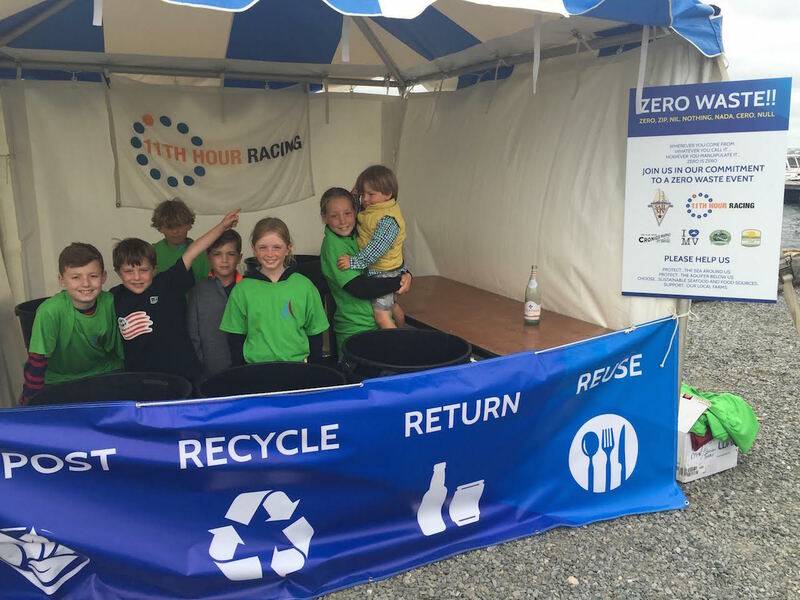 According to the organizers of the 2016 Vineyard Cup, they had over 1,000 people walk through the main regatta tent during three days and they produced less than 4 pounds of trash. They say it wasn’t hard but it did take a little common sence and….some cute volunteers to steer people in the right direction. 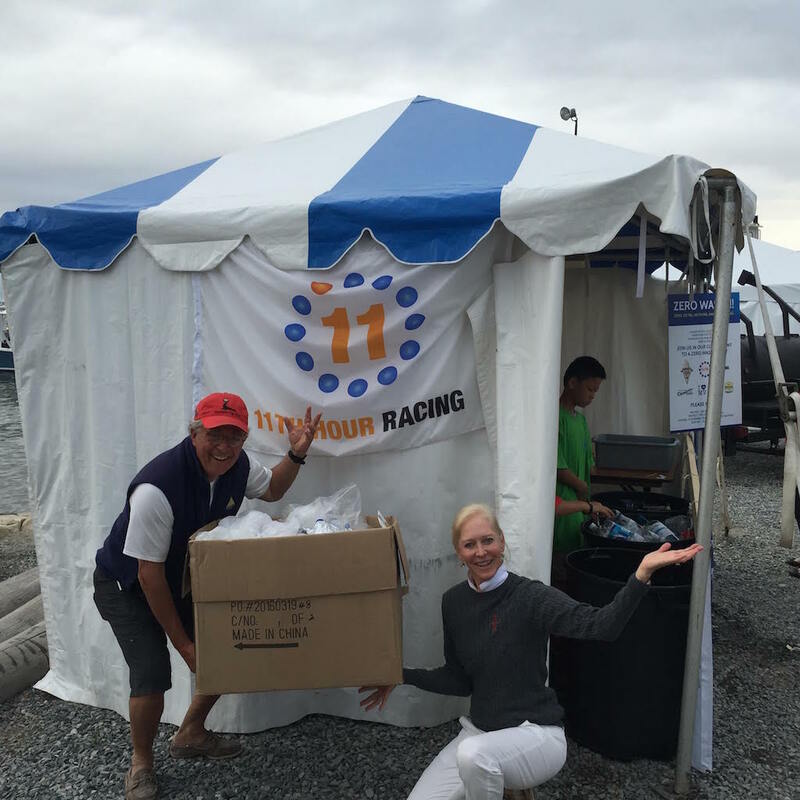 Here’s some of what they and their sustainability partner 11th Hour Racing did to reduce the environmental impact of their regatta. That’s all the trash from a three day regatta! The main regatta tent (where over 1,000 meals were served) produced less than 4 pounds of non-recyclyable trash. This was mostly because of plastic bags that held purchased ice cubes. The organizers say they could have done better if they used an ice machine (instead of using ice that had to be in plastic bags). Zero Paper products were used (and then thrown away). They used a party rental company who does weddings who partnered with the organizers by giving a deep discount to support their event. Zero single serve water plastic bottles were used. They simply banned them. They used 1,800 returnable bottles instead. The money from the returnables went to high school kids who were happy to pick it up and take it. They served 100% locally sourced food (over 1,000 meals). Organizers say local farms would rather partner with a local organization than sell to a distributor. They say when it comes to all the recyclables, all you need are separate, clearly LABELED bins and some kids to help point people in the right direction. They saved 60 gallons of food waste compost that was given to local farms to use as fertilizer. A lot of local farms will even take meat and seafood scraps as it increases nitrogen in the soil. This is great news. Congratulations to everyone for pushing to keep trash out of the ocean. We need more thinking like this.